It was a short fall, but not without its highlights. This was definitely a strange fall. 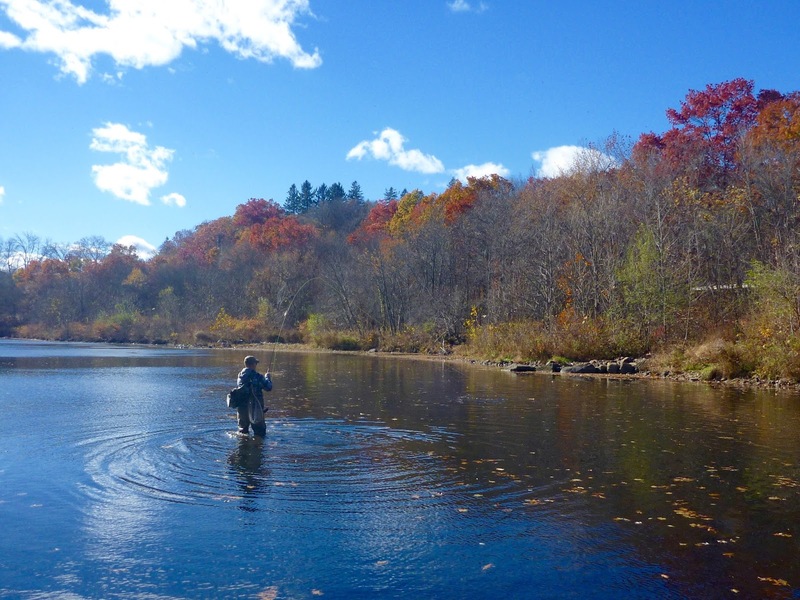 With water levels at historic lows, we were lucky to have a salmon season at all. I'll admit, I was not optimistic. I canceled my guide insurance policy in early October only to request it be rewritten a few weeks later. This was the first season I guided significantly more hours than I fished. Once the season started, I had only a couple of days to get my bearings before my first trip. After that, it was a whirlwind of activity until Thanksgiving weekend. The ultra low water made the salmon behave in ways I wasn't used to seeing before. When river was at its lowest levels, the fish seemed to favor depth over all else. If they could have moving water too, that was preferred. If the moving water was too shallow, they seemed to hide out in any deep depression they could find. A lack of rain stalled their usual movement into the secondary pools. The few times it did rain, fish moved out quickly. Since we had a low number of salmon in the river this year, they became harder to find once they spread out. I figured we might have epic dry fly fishing given how low and clear the water was. This was not the case. It was the first fall in a while I haven't at least moved a fish with a dry fly. I think they were too freaked out to come up, though maybe I just had bad luck. I don't think I tried fishing a hitched fly at all this season. Luckily, the salmon were still happy to take wet flies. As the water dropped, our flies got smaller and smaller. 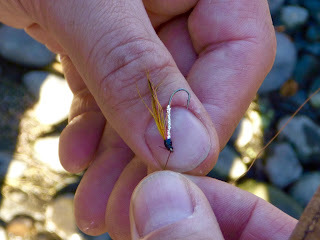 After watching several people lose fish on larger flies, I switched to flies tied on very fine wire hooks. It worked and the vast majority (90%!) of the fish either my clients or I hooked were landed. In the lowest water, a size 14 Mickey Finn did the trick! I had several clients hook, land, and release their very first Atlantic salmon. That is always exciting for me. A couple of them said it was the largest fish they had ever caught on a fly. I was very happy to be a part of that. It is one of the highlights of the job. I guided two clients into the same fish in the span of nine days. The salmon had a very distinct tail. The first time I saw it was in an unstocked pool in Naugatuck on November 8. Six days later, we had enough rain to move fish around. The salmon turned up again, this time in Beacon Falls, on November 17. It moved about five miles on one relatively small bump of water. Assuming it hasn't already been eaten, that fish is probably in the Housatonic now. Practice catch and release so others can enjoy the sport! The fishing seemed to slow down as we got into late November. 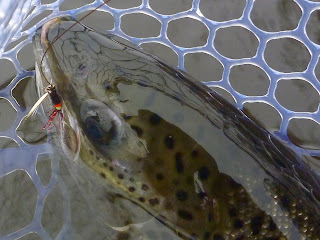 I pinpointed some salmon in a pool that is very difficult to fish with a fly. Unfortunately, my unorthodox presentation experiments didn't pay off. I have some ideas for next year, though. As always, there were many anglers who refuse to follow rules. Some of them seem legitimately ignorant of the seasonal regulations. Others just don't care. There is a definite lack of signage on the river, especially pertaining to salmon season. Because of this, some conservation officers let people off with a warning instead of fining them. If there is no fear of consequences, what is stopping offenders from breaking the rules again? I'm getting pretty sick of this and I am going to write letters and emails over the winter. It is time to be proactive. The squeaky wheel gets the grease and I plan being very squeaky. If I have to, I will print my own signs, bring a ladder, and hang them up around the river. This guy put on a show his first day of salmon fishing! I used a two handed rod less this season than in any other season since I started fishing with one. There just wasn't enough water for it. Fortunately, I got some time with a switch rod at the end of November and the beginning of December. I sure do miss the good old days of normal water levels and fishing with a two handed rod. Ally's Shrimp caught the lion's share of my own salmon this fall. Between myself and my clients, we hooked almost 50% of our salmon on flies between sizes 10-14. I've had small fly years before, but never 50%. Conversely, we caught fewer on tube flies this season than during a normal fall. Almost every fish we hooked was while using a floating line and untapered mono leader. My typical "Hail Mary passes" (Sunray fished fast or Snaelda fished slow) didn't work at all. This fall, it seemed like they either wanted a fly or they didn't. If they wanted it, they usually wanted it on the first pass. As such, we moved around quite a bit to find "players." Really working a pool seemed to have either no effect or a negative effect (you lose valuable time) this season. "Run and shoot"...like the 1990 Houston Oilers. 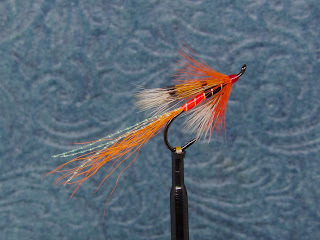 I will have some gear reviews coming up soon, as well as some fly tying stuff over the winter. I already have a couple orders of flies to tie for the upcoming season in Canada, so I might post a few of the interesting patterns here. In the meantime, thanks for reading this blog. I got a lot of great feedback this year. Have a happy holiday season! Pretty cool to hook the same fish in two locations 5 miles apart in short span of time! Yeah...shows how quickly some want to get out of there.